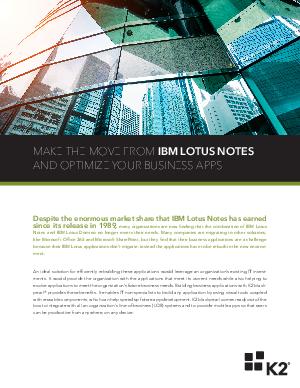 Are you migrating off of IBM Lotus Notes? Or did you migrate a while ago, but your business applications are still causing you trouble? Maybe Microsoft’s announced end-of-life for Microsoft InfoPath has you nervous about maintaining your workflows in Microsoft SharePoint? Whatever the motivation for your migration, K2 can help with the trickiest part of migrating off of IBM Lotus Notes: rebuilding your business applications. Unlike the email or unified communications parts of IBM Lotus Notes (or even the data underlying the business apps on it), applications themselves cannot migrate directly to a new environment. They have to be rebuilt there. Without the right tools, rebuilding your apps can be time-consuming and expensive — and it can still leave you with apps that fail to meet your business needs. Using consultants can cost you anywhere from $500,000 to $1,000,000 and take 6 to 12 months to get a single application — one that is inflexible and might no longer meet the needs of your changing business. [i] Moving app dev in-house to your IT department might not help much, either: having to support all levels of app development can take your IT department away from other critical tasks.